Neck pain is really frustrating, if not taken proper care to relieve the pain at the earliest possible time. This kind of chronic neck pain makes difficult to move leaving it completely numb or stiff. Morning neck pain often lasts for entire day causing backaches, headache, sciatica, migraines, and leg numbness, and mostly leaves people with anxiety and frustration. Pillows that provide optimum support and relief pressure can significantly enhance the sleep quality, with more comfort and sound sleep. On the other hand, the wrong pillow can cause a negative impact and can also worsen the neck pain and cervical leading to a sleepless night. Pillow loft differs from the sleep types, mainly those with severe neck pain. Too thin pillows lets the head to fall either too far or too back, putting more pressure on the neck and shoulders. While too thick pillows affect how closely the spine and neck are aligned. What Causes Chronic Neck Pain? There are various reasons behind severe neck pain and the most significant reason is the wrong choice of pillow. Having the right pillow with the right position is a vital necessity determining the quality sleep. The neck consists of muscles, cartilage, tendons, and seven tiny bones which make it sensitive. While the spine can be pinched or compressed, causing various degrees of numbness or pain, the neck is the most susceptible, especially while sleeping. Proper neck alignment with our spine and heads prevents cervical pain, stiffness, prevent injury. 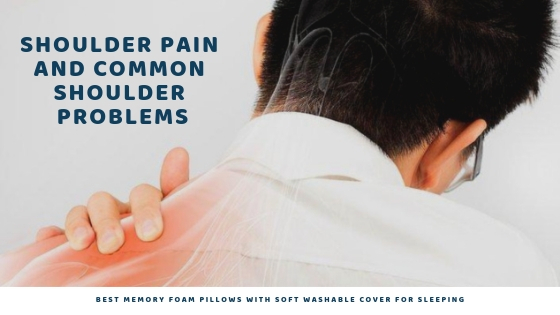 The Shredded Memory Foam Pillow offers the complete flexibility and moisture that conforms the body shape and structure in a comfortable position to maintain proper alignment all night. Whether you are a stomach sleeper, or side, a back sleeper you will experience the relief to your neck and cervical pain. The ergonomic design adjusts the pillow to your exact position and needs and offers a supportive and the firm comfort to your neck and head to alleviate any neck pain. The shredded foam is helpful for those who have the placing the pillow beneath the knees to sufficient comfort. Memory Foam Pillow is a durable, strong, and helpful for those with neck pain support. This pillow is ideal for the back sleeper that curdles our neck pain and muscles. The neck structure curdles to the pillow design and creates a proper neck alignment. Memory foam pillow facilitates ultimate comfort to sleep and helps in relieving neck pain. This pillow helps in reducing extra pressure on muscles and alleviates neck pain and other sleep issues. The contour shape curdles to the neck structure and creates a special shape structured to the neck and head offering a more comfortable and relaxed sleep at sleep. The Contour Memory Foam Pillow is perfect for the side sleeper that is useful to uphold the head and neck aligned. This pillow is the most recommended pillow for the neck pain and cervical pain relief. Contour pillow is the therapeutic solution for cervical pain and neck stiffness. The therapeutic pillow is really very helpful for Neck and cervical pain. Sleepsia is a reliable brand delivering high-quality memory foam pillow across the USA. The delivery process is really customer-friendly with proper instruction & information given for each product. To purchase Sleepsia, simply visit the official website www.sleepsia.co, identify your preference and place the best pillow that suits you or call at 1800-862-1084 in case of any doubts or queries. ← What Are the Best Pillows for Sleeping?